Mainland China is strictly anti-gambling. Both online and offline wagering are illegal with both punishable by fines and imprisonment. This goes for both operators and patrons. The country even attempts to block citizens' access to online casinos via the Great Firewall of China. Of course, the Chinese people don't always pay attention to the latest decrees that come down from on high. 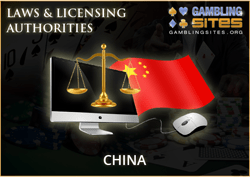 The online gambling market in China is massive despite the government's attempts to protect people from themselves. Bet365.com, Bodog Asia and other websites welcome Chinese players with open arms. We won't even try to tell you whether or not it's safe or legal to place internet bets while inside China, because we honestly don't know enough about the market to give you a definitive answer. Chinese law is strange and the country is home to a huge population. As ForeignPolicy.com put it, China is a place "where no vice is legal, but every vice is tolerated." Hong Kong and Macau are both considered "special administrative regions" in which China administers each region's defense and foreign affairs but leaves each region in control over its own domestic laws, police, and economy. Hong Kong and Macau each allow certain forms of gambling. Neither one of these regions has any system in place to monitor, regulate, or even allow online gaming sites to go live. The law neither prohibits nor permits online gambling; it simply doesn't address the issue. Potential operators have no avenue to even attempt to acquire an online gambling license. Therefore, online gambling is mostly dead in China. There are a couple of exceptions for internet sports betting, but there's nothing in place for casino gambling or poker. The rest of this section will address offline gambling only. Certain forms of gambling are legal in Hong Kong as long as they are managed by the government-sponsored Hong Kong Jockey Club (HKJC). The HKJC is a government-sponsored non-profit corporation that manages the only legal forms of gambling in Hong Kong. Residents are free to place bets via the HKJC, but all other forms of gambling are outlawed in Hong Kong. The allowed forms of gambling under the HKJC include parimutuel horse race betting, overseas soccer betting and the Mark Six lottery. There are about a hundred locations residents can visit to get in on the action. Not only is it illegal to run an unauthorized bookmaking operation in Hong Kong, but it's also illegal for visitors and residents to place bets with unauthorized bookmakers, even if those bookmakers are located outside Hong Kong. The penalties for doing business with illegal or overseas bookmakers include 9 months in prison and a $30,000 fine. Macau is significantly more gambling-friendly than the rest of China. In fact, Macau surpassed Las Vegas for gaming revenues in 2007. Macau is by far the largest gambling destination in the world. In 2013, Macau's gambling industry brought in more than $45 billion in revenue. The forms of legal gambling in Macau include traditional casino-style games, poker, and limited forms of horse racing. These forms are all offered offline only with the exception of local internet betting options for some casinos. Macau doesn't address, license, or even acknowledge online gambling. As such, there are no legitimate gambling sites based out of Macau. All gambling activities in Macau fall under the jurisdiction of the Gaming Inspection and Coordination Bureau (DICJ). The organization is responsible for legislating, enforcing and overseeing the entire gambling industry.